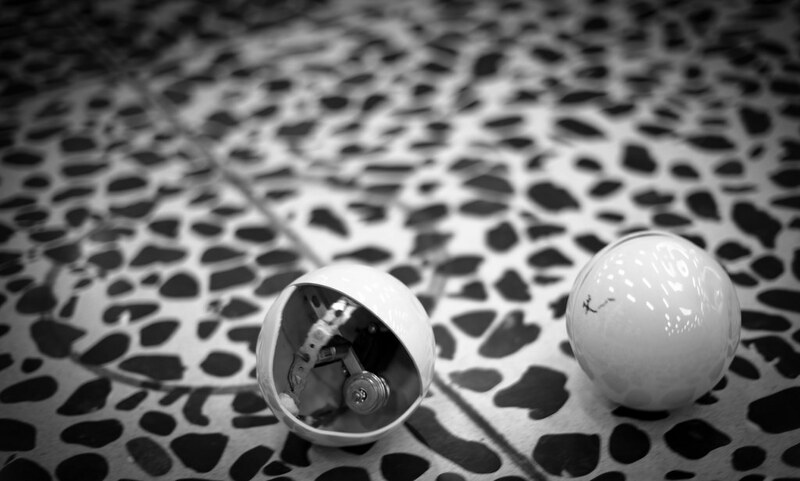 A dazzling if quirky outpouring of robot talent transformed the University of Gent into an experimental playground and dating agency for robot-human encounters in the recent 2011 ArtBots festival. Visitors were bemused and perplexed by several cute but certainly not cuddly critters in a lively atmosphere that encouraged playful exploration along with a healthy dose of levity. It was not only humans who became embroiled in sometimes surprising robot encounters. 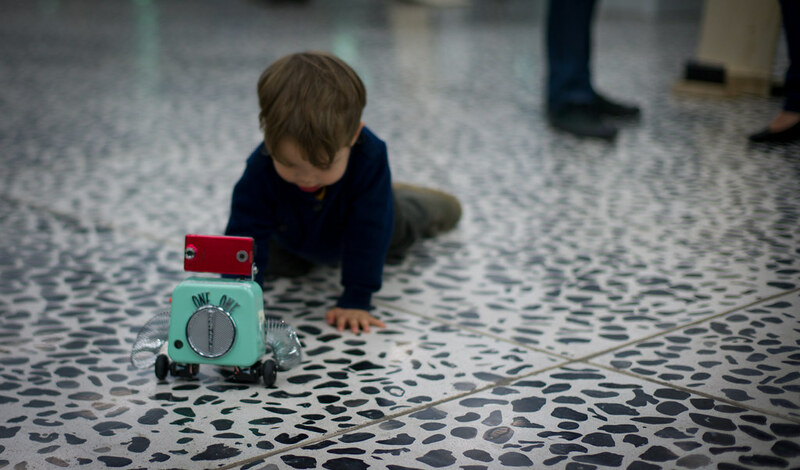 Two small story-gathering robots, presented as part of Alexander Reben's Acquired Knowledge, were designed to roam the exhibition floor and record video interviews with visitors, producing their own autonomous documentary. Equipped with motion detection sensors and voice synthesis to communicate with humans, the robots encountered an interesting challenge when they attempted to interview two dogs - friendly enough but otherwise untutored in the etiquette of robot interaction. The mutual cognitive dissonance resulted in an elaborate dance of sequential social faux pas, made even more awkward and amusing by the very different motor capacities of the respective species. Another work tried actively to flee encounters with visitors. Ivan Henriques's Jurema Action Plant consisted of a hybrid plant-machine robot incorporating a mimosa as its sensory apparatus. The plant was fitted with electrodes that could detect changes in its electromagnetic field and trigger movement. Anyone touching the plant caused the robot to move away from them, thus translating the mimosa s touch-me-not sensitivity into tangible robotic motor activity. Through this project, Ivan wanted to explore relationships between biodiversity, plant intelligence and machine intelligence. Shahar Zaks's Steadystate V2 continued the theme of sensitive robotic mechanisms responding to environmental changes through movement. The sculpture consisted of several autonomous light-sensitive units, physically connected to form a tower-like structure that moved independently in reaction to its environment. The sculpture as a whole underwent continuous, unpredictable changes in form as visitors moved around it. Emoti-bots by Katie Koepfinger and Burcum Turkmen transformed pieces of household furniture into emotionally responsive entities. A chair changed colour when you sat on it, but became dejected and wandered around the space moping when you moved away, while a lamp changed shape if you were nearby, but also got tired and gradually dimmed with use. In these works the designers sought to explore prototypical products for future homes that simulate and stimulate emotion. 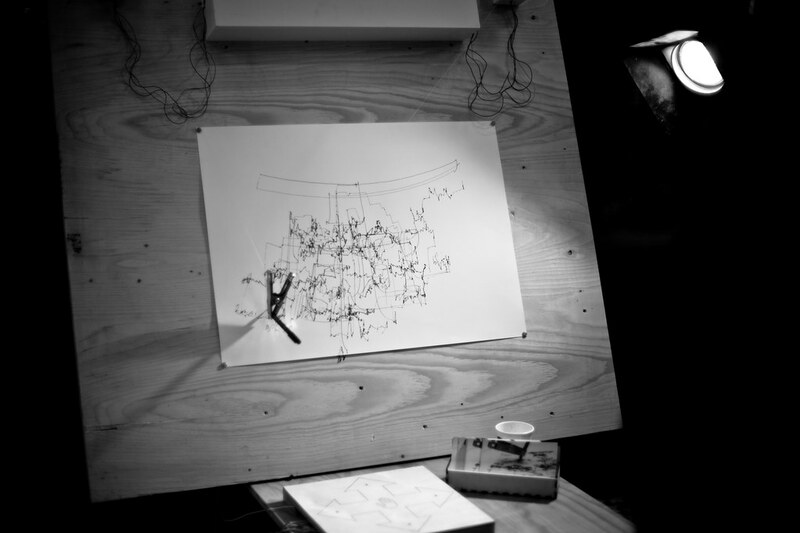 Meanwhile, SADbot ( Seasonally Affected Drawing Robot ) by Dustyn Roberts and Ben Leduc Mills was a solar-powered drawing machine equipped with a microcontroller, battery, motors controlling two cables attached to a pen, and big sheets of blank paper. It would doodle away happily when it was sunny but go to sleep in the dark. Visitors could interact and shape its sketches by moving their hands over a number of photocell sensors. Enigmatic and inscrutable, solid yet somehow fragile, Korinna Lindinger's Unrund work consisted of small porcelain spheres that seemingly defied categories of inanimate and living. The irregular, organically-shaped spheres produced patterns of movement and sound through swinging motions of motors inside them, rolling around the floor in a strangely lifelike way. Being made of porcelain entailed the possibility that these robot entities could fracture and break apart, thus incorporating a further element of natural decay and unpredictability to the work. Sound was a central focus for a number of pieces. 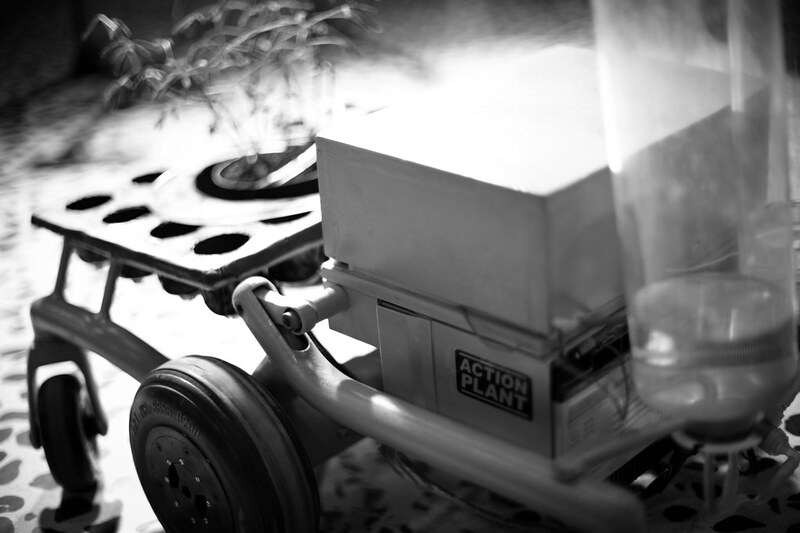 The Voice Extruder by Ranjit Bhatnagar gave physical shape to voices in the form of small biodegradable polymer extrusions that were both sculptural objects and musical instruments in themselves. Visitors could whisper, shout or scream into a microphone and give their utterances visual form. Not quite a robot, Alex Braidwood's Noisolation Headphones transformed its wearers into minotaurs with peculiar sonic horns - special headphones made of copper pipes. Alex was interested in questioning our relationship with the sonic environment, and wanted to create something of a visual spectacle as well as a listening experience. Wearing the Noisolation Headphones allowed a mechanically-created listening experience by structuring ambient sound through a series of valves, rendering environmental noise differently familiar. The wearer always experienced some kind of audible performance due to the seashell effect of the copper pipes, even if the surrounding soundscape was relatively subdued. A subdued soundscape was notably absent at the show, however, due to experimental one-robot band Korn by Logos - winner of the ArtBots public prize. 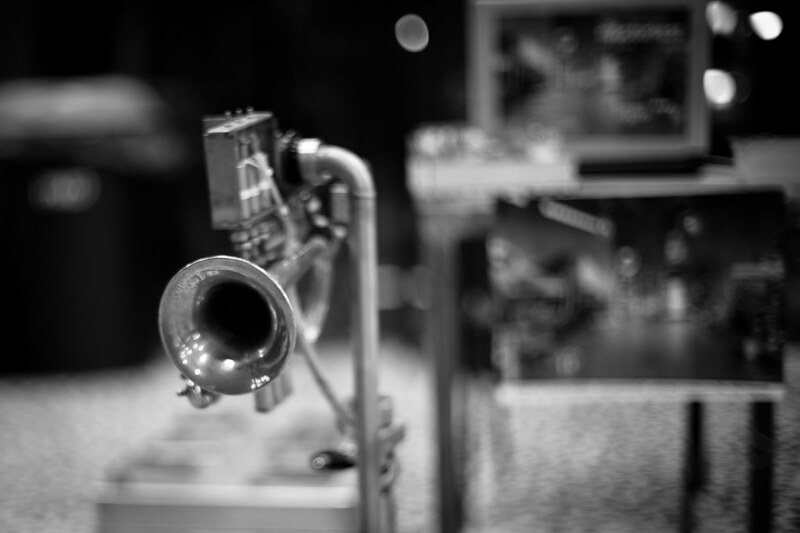 In feedback loops with dancing visitors and children attempting to feed it, Korn remained a constant presence in the background, producing a steady stream of cornet trumpeting and snare drum rhythms. As a sideshow to the sometimes circus-like atmosphere of this robotic playground, a research study was conducted for the LIREC project by SICS and the Mobile Life Centre which inadvertently became an experimental pixel art exhibit in its own right. The study focused on the hopes and fears surrounding robots for both audience and artists, and was a follow-up to a previous study on similar themes at ArtBots 2008. The robotic artists were interviewed about their contributions to the festival, their choice of materials and technologies, the concepts and ideas underlying their artworks, and their perspectives on robotic artifacts in society and culture as a whole. 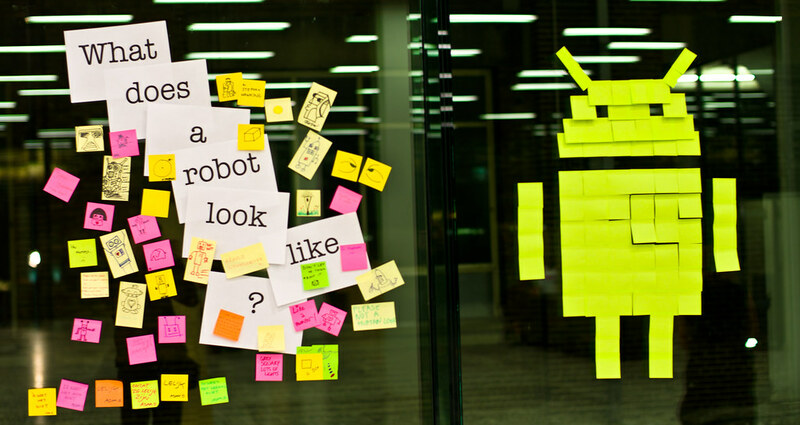 Visitors, on the other hand, were encouraged to write, draw, or scribble their spontaneous responses to four questions about robots on post-it notes and stick them to a large glass partition in the exhibition space. The glass quickly became covered with ad-hoc post-it pixels arranged in abstract patterns and shapes of visitors interpretations of what robots look like. A strong theme emerging from this year s ArtBots seemed to be the robots capacity for emotional sensitivity and even moodiness. These robotic entities were often highly suggestible, excitable, even nervous; they were shy, occasionally easily offended and hurt, and susceptible to very literal nervous breakdowns. On the other hand, given the right attention, they could become very sociable and friendly. Perhaps these quirks, foibles, and technical limitations even helped to encourage a more empathetic robot-human relationship. Rather than seeing the robot s capacity for interaction and communication solely as a function of engineering, the ArtBots event suggested how a robot s unique qualities and personality might emerge not only in spite of engineering limitations, but sometimes because of them. The robots on show didn t present seamless and perfect visages; no effort was made to conceal their nuts, bolts, wheels, sensors and other mechanisms. These elements were part and parcel of the robots unique personas, and helped make them more approachable and interactive. In this perspective, perfect engineering is not the primary objective. The goal is to unite engineering with imagination and ingenuity, working with the very limitations of a particular assemblage of software and hardware to create something that transcends the sum of its parts and takes on a life of its own. ArtBots Gent 2011 was co-produced by timelab (Ghent), FoAM (Brussels), the University of Ghent, ArtBots and Columbia University Computer Music Center.